Evening swim, originally uploaded by Eric Jeschke. 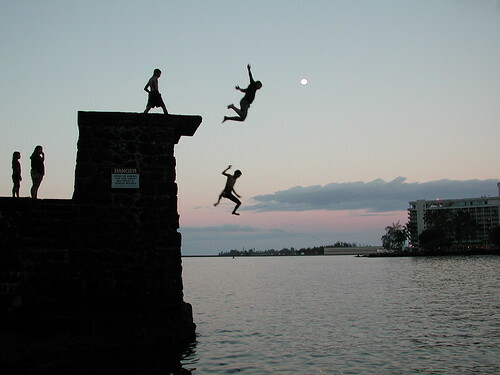 Children jump off an old diving tower in Hilo bay just after sunset. The silhouettes of the boys jumping into the water are outstanding..and caught at just the right time! We often paddle our kayak around this particular little island, called “Coconut Island”. It is maintained as a county park. The platform used to be for a diving board back in the olden days, before the two tsunamis that wiped out much of Hilo town. There is a big warning sign on it, but kids still jump off. I’ve gone off it a few times…it’s a pretty long way down (feels like it anyway)! Recently a hawaiian monk seal has been hanging out around there, among other places. Back in the waaay olden days, this was a Hawaiian “place of refuge” where commoners could go if they violated a kapu. There would be kahunas (priests, scholars, holy people) that lived there that would possibly pardon them for their crime (which could be as simple offense as eating the wrong kind of food, etc.). The official name is still “Moku ola”, although most people I know call it Coconut Island. It’s an interesting place. Oh, and when the weather is good, there is great view of Hilo town lights and Mauna Kea above it.